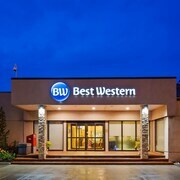 Situated in Richmond Hill, this hotel is 0.8 mi (1.3 km) from Richmond Hill Centre for the Performing Arts and within 9 mi (15 km) of Lake Wilcox Park and Canada's Wonderland. Vaughan Mills Mall and Casa Loma are also within 20 mi (32 km). 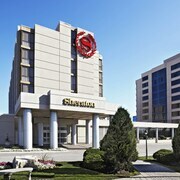 This family-friendly Richmond Hill hotel is located in the business district, within 3 mi (5 km) of First Markham Place, Flato Markham Theatre and Elvis Stojko Arena. Fairview Mall and Seneca College are also within 6 mi (10 km). 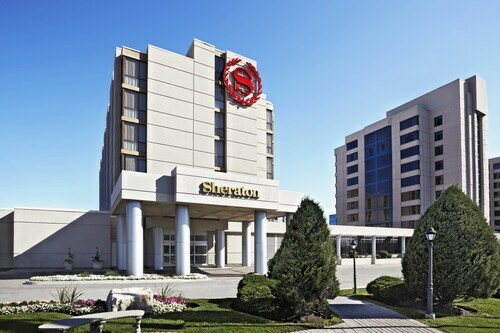 Situated near the airport, this eco-friendly hotel is within 3 mi (5 km) of First Markham Place, Flato Markham Theatre, and Elvis Stojko Arena. Seneca College and Markham Pan Am Centre are also within 6 mi (10 km). 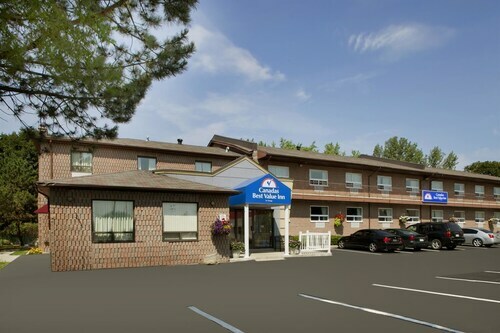 Situated in Richmond Hill, this hotel is 1.7 mi (2.7 km) from Lake Wilcox Park and within 6 mi (10 km) of Town Park and Sheppard's Bush. Hillary House National Historic Site and Richmond Hill Centre for the Performing Arts are also within 6 mi (10 km). How Much is a Hotel Room in Richmond Hill? 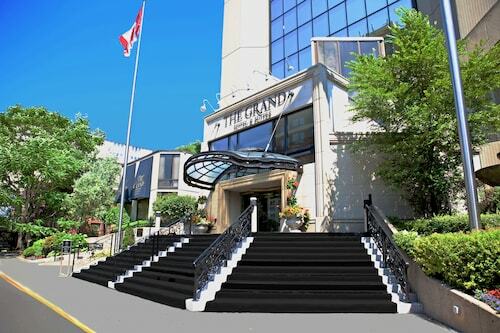 Hotels in Richmond Hill start at $63 per night. Prices and availability subject to change. Additional terms may apply. When you are deciding where to base yourself in Richmond Hill, there is a wide array of options. 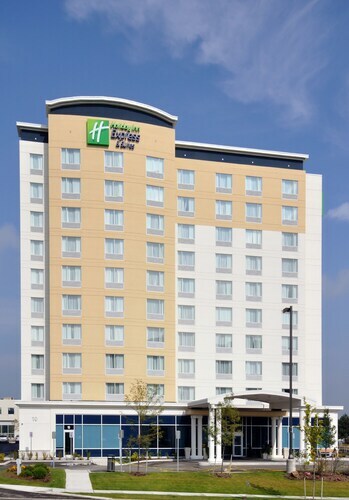 We currently offer 21 places to lay your head within a 6-mile (10-kilometer) distance of the center of Richmond Hill. The Diamond Vacation Homes - Bayview Avenue is an excellent Travelocity-listed lodging choice as it is conveniently located to Richmond Hill. 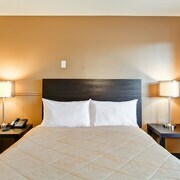 3 miles (5 kilometers) away from the heart of Richmond Hill is the Canadas Best Value Inn Richmond Hill. This is a a smart option for travelers who are looking for economical options. 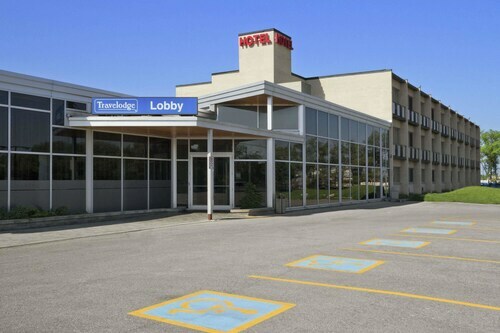 Another budget option in this area is the Travelodge Richmond Hill. The The Ritz-Carlton, Toronto is around 18 miles (29 kilometers) away from the center of Richmond Hill. 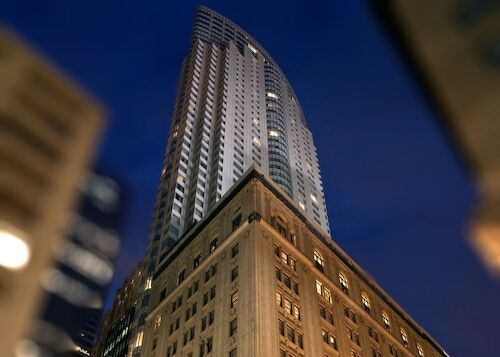 Another alternative is the Four Seasons Hotel Toronto, which is located 16 miles (26 kilometers) away. 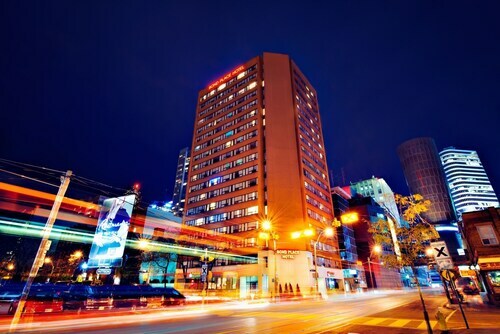 Other places to stay close by are the The Hazelton Hotel Toronto and the Windsor Arms Hotel. After you have thoroughly explored Richmond Hill, why don't you explore a little more of the area? The Southern Ontario area has many things to see. Southern Ontario has beaches and coastal plains, and other commonly visited sites include traditional villages, churches and art museums. Wise travelers in this region of Canada often enjoy skiing, cross-country skiing and snow shoeing. Downtown Toronto is 17 miles (27 kilometers) south of Richmond Hill and features Church of the Holy Trinity and Mackenzie House. 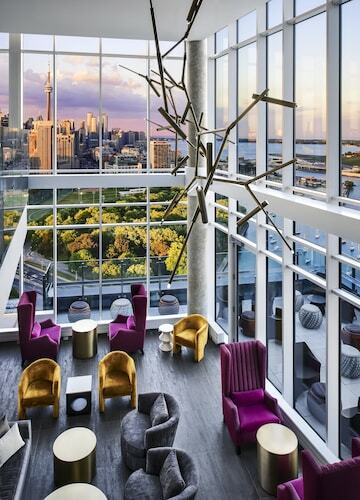 When you spend any time in Downtown Toronto, check out the Shangri-la hotel Toronto and Trump International Hotel & Tower Toronto. 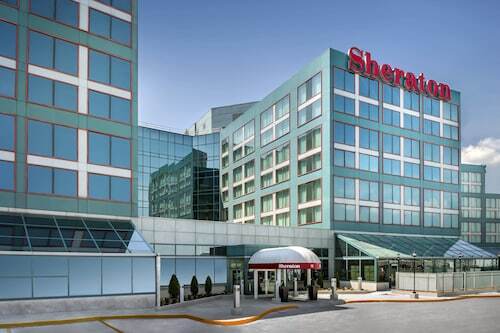 Or, you could consider staying in Erin Mills, 30 miles (46 kilometers) southwest of Richmond Hill, where you have the options of the Glenerin Inn and Homewood Suites by Hilton Toronto/Oakville. If you visit Erin Mills, make sure you venture to the Mississauga Heritage Foundation and Leslie Log House. If sport is your most-cherished pastime, be sure to visit Air Canada Centre, which is situated 18 miles (29 kilometers) to the south of Richmond Hill. Find a Travelocity-listed room not far from the action at the Le Germain Hotel Maple Leaf Square or the Le Germain Hotel Toronto. Pearson International Airport can be found 18 miles (29 kilometers) away from central Richmond Hill. 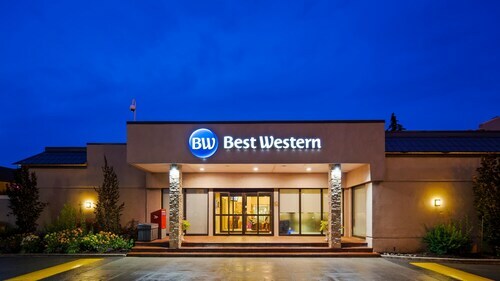 Wise travelers who need to stay close by can look into a convenient option in the Homewood Suites by Hilton Toronto Airport Corporate Centre or the Sandman Signature Toronto Airport Hotel. The property is a gem! The Jr. Suite is exactly as pictured on their website. We enjoyed all their gym, spa (the rooftop spas were scenic and the views were amazing- hellooooo Toronto! ), pools and breakfast at The Grand. We could see St. Lawrence Market and CN Tower from our room. The front desk and staff were incredibly helpful, professional and honest. The bellmen were always at the front doors, ready to greet and/or help guests with transportation, touristy suggestions, and overall kindness. Our rooms were cleaned, fresh towels, and the front desk staff were always warm and accommodating. There were three minor "oops/beyond their control things". For example, I pulled a knob in a drawer and the knob came flying off, a cupboard drawer kept getting stuck when opening and the surrounding area is a bit sketchy (arriving at midnight, a man shouted at us for money, a few panhandlers down the street). We felt safe to walk around (in the daytime) to the Eaton Centre, The Carbon Bar, Hokkaido Ramen Santouka are a must and a short drive was To-ne Sushi & Bar and Butter Chicken Factory are an absolute must; the surrounding area in the Garden District is an older part of town and has what any large metropolitan city has. Because the staff were the epitome of hospitality, the bellmen arranged for a car for us (after our Uber was not exactly as described and tried to charge us for a ride we didn't take). We would stay at The Grand again, our trip was made better for it.